This plant has it all! Pineapple Guava boasts beautiful foliage, sweetly fragrant flowers (that are edible too) and delicious fruit - all on a vigorous plant that grows in just about any sunny location with well-drained soil. 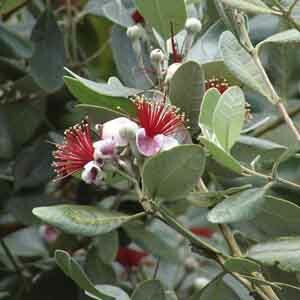 The common name, "Pineapple Guava" comes from the refreshing pineapple-mint flavored fruit. The edible flowers have a lightly crunchy texture and add an unexpected touch to salads or used as a garnish. Evergreen foliage easily trained as espalier, screen or tree. Looks beautiful in the garden as a specimen or clipped hedge. Nice for larger patio containers. Enjoys any sunny, well-drained location. Heat and drought tolerant selection will spread faster if watered regularly. Prune freely to maintain desired size and shape.